Mascots and football legends and a championship game, oh my! The first weekend of December brings together our community’s love of college football and helping children in the greater Charlotte region succeed. 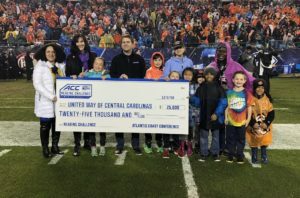 United Way of Central Carolinas has partnered with the Atlantic Coast Conference for the past four years supporting local, youth-education based charitable initiatives associated with the Dr Pepper ACC Football Championship Game. This year the ACC and United Way continued their partnership to support student literacy by working with Charlotte-Mecklenburg Schools through the ACC United Way Reading Challenge. With a focus on improving reading proficiency at three CMS schools – Crown Point Elementary, Clear Creek Elementary and Landsdowne Elementary – the reading challenge encouraged students to spend more time reading for a chance to attend the Dr Pepper ACC Football Championship Game and be honored on the field during the game. For three weeks this fall students recorded their number of pages read – with over 200,000 pages logged during the reading challenge. 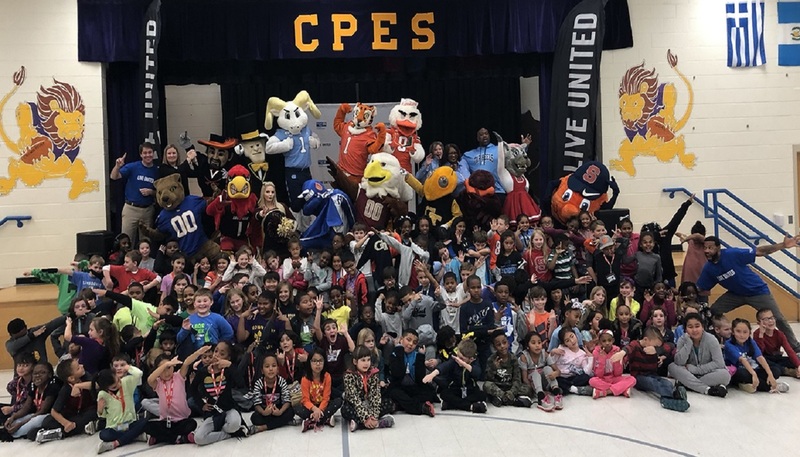 Leading up to the big game on Saturday, December 1, students and principals from the three elementary schools gathered on Friday, November 30 at Crown Point Elementary to celebrate a successful reading challenge during a high-energy pep rally with ACC mascots. We were joined by radio personality and Charlotte Hornets arena host Fly Ty, who introduced the mascots and led the students in chants, songs and dancing. 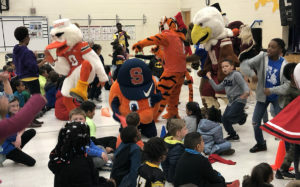 ACC Executive Associate Commissioner & Chief of External Affairs Amy Yakola also read “The Book with No Pictures” to the students while the mascots acted it out. In addition to rewarding the hard-working students with a fun event, the ACC presented 1,000 gift cards to each principal of the three elementary schools. On Friday night, members of our Alexis de Tocqueville Society had a unique and fun opportunity to engage with football greats during the 2018 ACC Night of Legends in Charlotte. The signature event recognized a legend from each ACC football member institution, along with 2018 ACC football award winners. The following morning, we joined the community bright and early in uptown Charlotte for the ACC Fan 5K and Kids Mascot Run. All event proceeds were given to support United Way’s work. Finally, on Saturday night the rain didn’t stop us from having a blast with students at the Dr Pepper ACC Football Championship Game. The students joined us on the field, where they were recognized for their hard work and where the ACC presented $25,000 to United Way of Central Carolinas to go toward education initiatives in our community. Want to see more photos from these great events? View them here!